Darren Bent scored on his Tottenham debut as Spurs began their pre-season schedule with a 3-1 win at Stevenage. 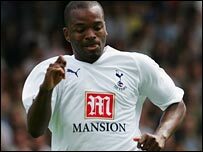 The £16.5m summer signing from Charlton latched on to Steed Malbranque's pass and clipped his effort over the keeper for Spurs' second goal. Bent was replaced on 68 minutes by Andy Barcham after Adel Taarabt's 25-yard drive had put the visitors 3-1 ahead. Robbie Keane scored from the spot for the first and Ollie Allen equalised before Bent and Taarabt sealed the win. Fellow new signings Gareth Bale and Younes Kaboul were not among the Spurs squad at Broadhall Way.